By Thomas Egan | The endangered Sonoran pronghorn, or “Desert Ghost,” may be returning soon to its historic haunts in the southern California Deserts. The United States Fish and Wildlife Service is in the process of finalizing an Endangered Species Act Non-essential, Experimental Population Rule, which would allow this Spirit of the Desert to be reintroduced to California as a critical recovery plan action. If approved, the Service in collaboration with the United States Navy and Army, Arizona Game and Fish Department, and California Department of Fish and Wildlife, would reintroduce approximately twenty pronghorn to a protected area on the Chuckwalla Bench, east of Palm Springs. The last California band of Sonoran pronghorn were extirpated here in the 1940s. A dedicated band of volunteer nongovernmental organizations have also pledged their help and support to ensure all appropriate habitat improvement needs, along with monitoring necessary to support this effort, are met. Smaller and lighter in color than its iconic, far-ranging brethren known from the Great Plains, the Ghost’s widely-spaced, piercing black eyes peer out above a long, narrow nose, beneath short blackish horns and erect burro-like ears. These physiologic traits afford an incredibly broad view for this skinny-legged, barrel-chested ungulate who commonly frequents open creosote bush scrub and desert ironwood washes. Photo above: Adult Sonoran Pronghorn, or the Desert Ghost. Photo by Jim Atkinson, U.S. Fish and Wildlife Service. Yet those same ungainly legs, along with a huge heart and expansive lungs, power the Ghost to speeds of up to sixty miles an hour – faster than any other terrestrial animal in North America. So even though their tan to white-colored fur enables them to blend superbly with arid Southwestern lands, they need not hide to escape danger. They simply spy danger coming from distances afar, with their almost 360 degree field of vision, and easily outrun it. Or at least they outrun most danger. As one of five pronghorn subspecies and historically limited to just the Sonoran and Colorado Deserts, the Ghost has likely never been abundant. Nor has it evaded wide-spread habitat loss and degradation, incompatible livestock grazing, paved roads, canals, fencing, and bullets. Dwindling water availability and suitable access for the wide-ranging Ghost prompted the United States Government to list it as one of America’s first endangered species, through a precursor to the 1973 Endangered Species Act. The Ghost has similarly been listed as endangered by the Mexican Government across the border in the southernmost extent of its range. In the decades that followed the listing of this species as imperiled, the Ghost limped along in weak population number north and south of the border – averaging only about 140 animals in Arizona. While the effects of drought on fawn survival in the Ghost’s range have long concerned wildlife managers, a crippling drought in 2002 resulted in a disastrous population crash – leaving only 19 older animals to carry on the Ghost’s legacy in the United States! By 2003, the Service began a captive breeding program at the Cabeza Prieta National Wildlife Refuge (NWR) in Arizona, working with other agencies on both sides of the border. In 2006, the first captive-bred Ghosts were successfully released to supplement what was left of the wild pronghorn population. A second captive breeding population was then established at the Kofa NWR in 2011. 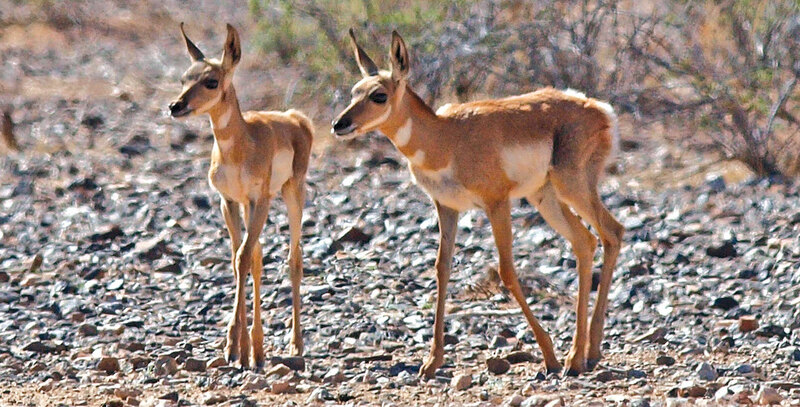 The first group of translocated pronghorn was released on the Kofa NWR in 2013 and are now roaming freely. Another population was also initiated within Arizona’s Saucedo Mountains in 2015. Following significant increases in pronghorn population numbers as a result of these efforts, the 1998 Sonoran Pronghorn Recovery Plan was revised in 2016, recommending the initiation of an additional experimental population of Sonoran pronghorn in southeastern California. Establishment of several disjunct populations of an endangered species promotes superior population representation, resiliency, and redundancy; and it provides the best assurance that a single catastrophic event, or barriers to seasonal/migratory animal movement, will not result in a species’ extinction. Re-introduction of a species into its historic range generally offers the best chance of successfully establishing such a disjunct wildlife population, particularly those with specific seasonal movement or migratory patterns such as the Sonoran pronghorn. The Ghost once ranged widely across the Colorado Desert in southeastern California as well as across the Sonoran Desert in southwestern Arizona and northern Mexico. In studying potential Sonoran pronghorn re-introduction sites, several California areas were evaluated with respect to forage suitability, current human uses/impacts, suitable habitat acreage, and reintroduction feasibility. The Chuckwalla Bench, encompassing military reservation and adjacent public lands within the Chuckwalla Area of Critical Environmental Concern, was determined to offer the best chance of re-establishing the species within the State. This initial proposed reintroduction area has been expanded to include the potential for animals to move northward into Rice Valley, across the Mojave Trails National Monument, and into the Mojave National Preserve. Sonoran pronghorn are known to move nomadically in response to changing forage conditions and water availability as a result of sporadic rainfall. While the Chuckwalla Bench has been found to support necessary habitat features for this species, the Ghost will need to be protected until such time as initial bands of animals are acclimated to their surroundings. Additional artificial water improvements such as “guzzlers” will be installed in an initial holding area and sufficient food will be provided to maximize the success of this reintroduction effort. All reintroduced animals will be carefully screened for health parameters, outfitted with global positioning system (“GPS”) tracking collars, and then monitored following translocation. To this end, Defenders of Wildlife and others are currently seeking funding to secure these collars. GPS collar movement data will prove extremely useful in adaptive management of reintroduced animals, securing/protecting necessary habitat features, and in subsequent translocation of additional animals. While many challenges lie ahead for this ambitious endeavor, with a little luck we may soon see the Desert Ghost, a quintessential part of California’s historic wildlife legacy, return to its desert home. Tom Egan is the California Desert Representative for Defenders of Wildlife. He is an ecologist by trade, an environmental activist by nature, and previously served as the Lead Wildlife Biologist for the Bureau of Land Management in the Barstow Field Office of the California Desert District. Other articles detailing his work can be viewed at Defenders Wild Without End. Medium: https://medium.com/wild-without-end.